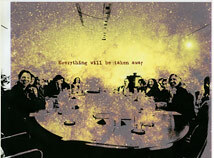 Everything #21, 2010-13. 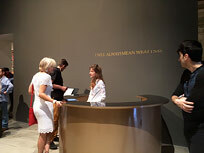 Installation: Four vintage wall blackboards in lacquered wood frames, each mounted on wall at eye-level in landscape orientation and covered with single handwritten sentence repeated 25 times in white chalk handwritten cursive text. Each framed blackboard 120 cm x 250 cm. #10001.1-4. Detail: #2 of 4. Venice Biennale installation, Central Pavilion in the Giardini della Biennale, Gallery 20. Collection Adrian Piper Research Archive Foundation Berlin. © APRA Foundation Berlin. 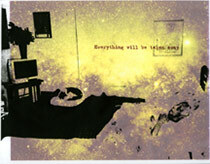 Everything #2.2, 2003. 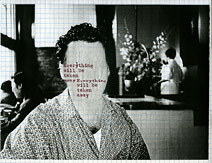 Photocopied photograph on graph paper, sanded with sandpaper, overprinted with inkjet text. 11” x 8½”, (21,6 cm x 27,9 cm). #03001.2. Venice Biennale installation, Central Pavilion in the Giardini della Biennale, Gallery 12. Collection Bertrand and Iréne Jacoberger. © Adrian Piper Research Archive Foundation Berlin. Everything #2.3, 2003. Photocopied photograph on graph paper, sanded with sandpaper, overprinted with inkjet text. 11” x 8½”, (21,6 cm x 27,9 cm). #03001.3. Venice Biennale installation, Central Pavilion in the Giardini della Biennale, Gallery 12. Collection Adrian Piper Research Archive Foundation Berlin. © APRA Foundation Berlin. Everything #2.4, 2003. Photocopied photograph on graph paper, sanded with sandpaper, overprinted with inkjet text. 8½” x 11”, (21,6 cm x 27,9 cm). #03001.4. Venice Biennale installation, Central Pavilion in the Giardini della Biennale, Gallery 12. Collection Adrian Piper Research Archive Foundation Berlin. © APRA Foundation Berlin. Everything #2.5, 2003. Photocopied photograph on graph paper, sanded with sandpaper, overprinted with inkjet text. 8½“ x 11”, (21,6 cm x 27,9 cm). #03001.5. Venice Biennale installation, Central Pavilion in the Giardini della Biennale, Gallery 12. 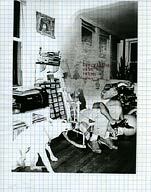 Collection of the Adrian Piper Research Archive Foundation Berlin. © APRA Foundation Berlin. Everything #2.6, 2003. 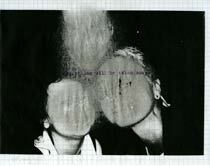 Photocopied photograph on translucent vellum, superimposed on inkjet print photograph and overprinted with inkjet text; combined in vinyl paper protector. 11” x 8½”, (21,6 cm x 27,9 cm). #03001.6. Venice Biennale installation, Central Pavilion in the Giardini della Biennale, Gallery 12. 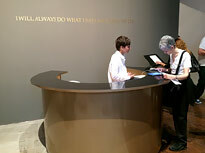 Collection Adrian Piper Research Archive Foundation Berlin. © APRA Foundation Berlin. Everything #2.7, 2003. 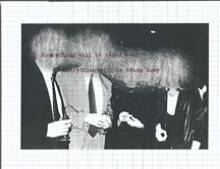 Photocopied photograph on graph paper, sanded with sandpaper, overprinted with inkjet text. 11” x 8½", (27,9 cm x 21,6 cm). #03001.7. Venice Biennale installation, Central Pavilion in the Giardini della Biennale, Gallery 12. Collection Adrian Piper Research Archive Foundation Berlin. © APRA Foundation Berlin. 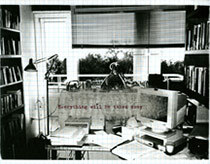 Everything #2.8, 2003. Photocopied photograph on graph paper, sanded with sandpaper, overprinted with inkjet text. 11” x 8½", (27,9 cm x 21,6 cm). #03001.8. Venice Biennale installation, Central Pavilion in the Giardini della Biennale, Gallery 12. Collection Adrian Piper Research Archive Foundation Berlin. © APRA Foundation Berlin. Everything #2.9, 2003. Photocopied photograph on graph paper, sanded with sandpaper, overprinted with inkjet text. 8½” x 11”, (21,6 cm x 27,9 cm). #03001.9. Venice Biennale installation, Central Pavilion in the Giardini della Biennale, Gallery 12. Collection Adrian Piper Research Archive Foundation Berlin. © APRA Foundation Berlin. Everything #2.10, 2003. 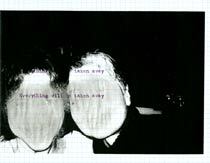 Photocopied photograph on graph paper, sanded with sandpaper, overprinted with inkjet text. 8½” x 11”, (21,6 cm x 27,9 cm). #03001.10. Venice Biennale installation, Central Pavilion in the Giardini della Biennale, Gallery 12. Collection Adrian Piper Research Archive Foundation Berlin. © APRA Foundation Berlin. 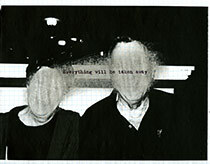 Everything #2.11a, 2003. Photocopied photograph on bond paper, sanded with sandpaper, overprinted with inkjet text. 11” x 8½", (21,6 cm x 27,9 cm). #03001.11. Venice Biennale installation, Central Pavilion in the Giardini della Biennale, Gallery 12. Collection Adrian Piper Research Archive Foundation Berlin. © APRA Foundation Berlin. 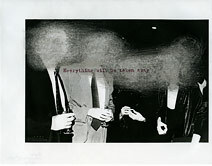 Everything #2.12a, 2003. Photocopied photograph on bond paper, sanded with sandpaper, overprinted with inkjet text. 11” x 8½”, (21,6 cm x 27,9 cm). #03001.13. Venice Biennale installation, Central Pavilion in the Giardini della Biennale, Gallery 12. Collection Adrian Piper Research Archive Foundation Berlin. © APRA Foundation Berlin. 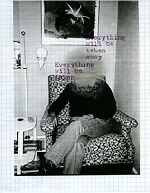 Everything #2.12b, 2003. 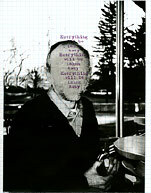 Photocopied photograph on graph paper, sanded with sandpaper, overprinted with inkjet text. 11” x 8½”, (21,6 cm x 27,9 cm). #03001.14. Venice Biennale installation, Central Pavilion in the Giardini della Biennale, Gallery 12. Collection Adrian Piper Research Archive Foundation Berlin. © APRA Foundation Berlin. Everything #2.13, 2003. 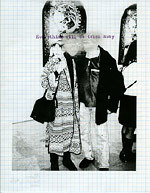 Photocopied photograph on graph paper, sanded with sandpaper, overprinted with inkjet text. 11” x 8½”, (21,6 cm x 27,9 cm). #03001.15. Venice Biennale installation, Central Pavilion in the Giardini della Biennale, Gallery 12. Collection Adrian Piper Research Archive Foundation Berlin. © APRA Foundation Berlin. Everything #2.14, 2003. 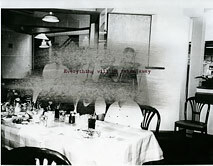 Photocopied photograph on translucent vellum, superimposed on inkjet print photograph and overprinted with inkjet text; combined in vinyl paper protector. 11” x 8½”, (21,6 cm x 27,9 cm). #03001.16. Venice Biennale installation, Central Pavilion in the Giardini della Biennale, Gallery 12. Collection Adrian Piper Research Archive Foundation Berlin. © APRA Foundation Berlin. Everything #2.15, 2003. 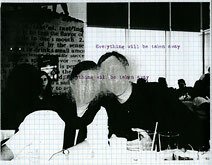 Photocopied photograph on graph paper, sanded with sandpaper, overprinted with inkjet text. 11” x 8½”, (21,6 cm x 27,9 cm). #03001.17. 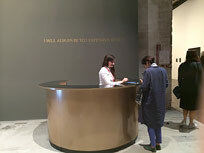 Venice Biennale installation, Central Pavilion in the Giardini della Biennale, Gallery 12. Collection Adrian Piper Research Archive Foundation Berlin. 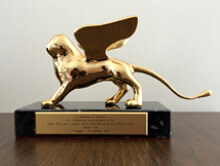 © APRA Foundation Berlin.